Circular saws are deigned to make straight cuts in everything from plastic to heavy timbers. Sidewinder - more common circular saws with the motor sitting perpendicular to the blade. Trim Saws - Smaller sidewinders are called trim saws. Trim saws are easier to maneuver. They are ideal for cutting plywood, trim and other thin materials. In-Line - In-Line saws are typically heavier and more expensive, but provide more power and make less noise. In-Line saws are also know as worm drive saws or hypoid saws. Blade Size - Ranges from 4 inches to 16 inches and larger. The most common size is the 7 ¼ inch blade. Electric Brake - stops the blade quickly to help make several cuts rapidly. Weight - a 7 ¼ inch saw may weigh between 9 and 12 pounds. Bevel Angle - All can do 45 degrees. Many can do 50 or 55 degrees. Preset Bevels - can lock at precisely 22 ½, 45, etc. Laser Guide - some newer models have lasers that show where the cut will be made. Power Source - can be corded or cordless. Cordless saws are becoming more powerful, however their operating time is still limited to 60 to 100 2x4s on each charge. Handed - Left-Handed vs. Right-Handed - many models come in versions for both types of people. Motor Power - measured in amps. 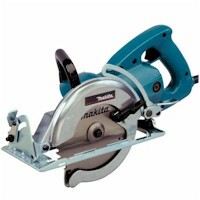 Safety Feature - almost every circular saw sold today comes with a built in blade guard and safety switch. Determine the size and power of saw you will need. Choose the smallest size that will handle all of your jobs. The smaller the saw the easier it is to maneuver. 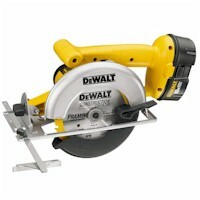 If you are uncertain, a 15 amp, 7 ¼ inch saw will handle almost all general cutting needs. Determine if a cordless saw is possible. As a rule of thumb, a cordless saw is a good 2nd or 3rd saw, but not a good primary saw. If the power runs out, you are stuck waiting for it to recharge.